Brenau’s Research Symposium is next Friday, April 5, and we are still looking for five more moderators to help us make the presentation sessions run smoothly. Please contact Kelly Peters (ude.uanerb@1sretepk) if you are interested in moderating one of the following sessions. Post-War Fashion in Meeting Room A, 2-2:50 p.m.
Economics in PT 127, 2-2:50 p.m.
Community Engagement in PT 127, 3-3:50 p.m.
20th Century Fashion in Meeting Room A, 4-4:50 p.m. Resilience in Meeting Room C, 4-4:50 p.m. The Research Symposium will be held from noon to 5 p.m. Friday, April 5, and we are looking for moderators to help run the sessions. Moderators are responsible for introducing the presenters, making sure they stay within their allotted amount of time, and asking a question or two to get some discussion going if there aren’t any questions coming from the audience. Most sessions have three presentations and each session is 50 minutes long. Please contact Kelly Peters (ude.uanerb@1sretepk) if you are interested in moderating one of the following sessions. Patient Support PT 127, 1-1:50 p.m.
Post-War Fashion Meeting Room A, 2-2:50 p.m.
Economics PT 127, 2-2:50 p.m. Fashion Accessories Meeting Room A 3-3:50 p.m.
Media PT 122, 3-3:50 p.m.
Community Engagement PT 127, 3-3:50 p.m.
20th Century Fashion Meeting Room A, 4-4:50 p.m.
Environmental PT 122, 4-4:50 p.m. Workplace Environment PT 127, 4-4:50 p.m. Please join Brenau’s Staff Development Committee and Alpha Gamma Delta Sorority in supporting the Georgia Mountain Food Bank this week at the following events. 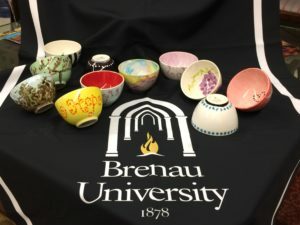 From 11 a.m. to 3 p.m. Wednesday, Feb. 13, Alpha Gamma Delta will be sponsoring a Bowl Painting event in the lobby of in Yonah Hall. 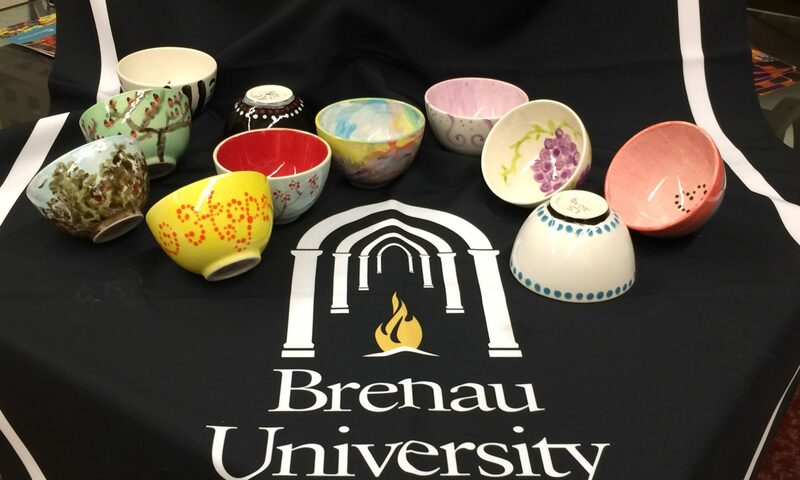 We invite you to come paint “empty bowls” for the Empty Bowl Luncheon, an annual fundraiser benefiting the Georgia Mountain Food Bank. The cost to paint a bowl is normally $8 each. However, if you are one of the first 33 people, Alpha Gamma Delta will subsidize the cost. You will pay only $5 per bowl, which will end up feeding up to 100 people. From 12-2 p.m. Friday, Feb. 15, we will wrap up the week with a Community Service Event at the Georgia Mountain Food Bank, and all faculty, staff and students are encouraged to participate. Faculty and staff will receive 1 Wellness point for participating in the food bank service event, and hourly staff have been given permission to remain clocked in for the event. Sign up today, Tuesday, Feb. 12, to participate in the Georgia Mountain Food Bank volunteer event on Friday, Feb. 15, at www.volgistics.com/ex/portal.dll/ap?ap=386706330. List “Brenau University” as the group name. The Staff Development Committee and Alpha Gamma Delta thank you for your support of these important events during our Hunger Awareness Week! The Staff Development Committee and Alpha Gamma Delta sorority invite you to participate in Hunger Awareness Week, the week of Feb. 11. Events are scheduled throughout the week, including a speaker, documentary screening, food drive competition, bowl painting event and a community service day at the Georgia Mountain Food Bank. The Occupational Therapy at Brenau East. The week will kick off with a talk by Phil Dennis, community engagement coordinator for the Georgia Mountain Food Bank, followed by a screening of the documentary “Hunger in America” at 3:30 p.m.
Alpha Gamma Delta will sponsor a bowl painting event, during which you can come paint “empty bowls” for the Empty Bowl Luncheon, an annual fundraiser benefiting the Georgia Mountain Food Bank. The cost to paint a bowl is normally $8 each. However, if you are one of the first 33 people, Alpha Gamma Delta will subsidize the cost, so you pay only $5 per bowl. Those $5 will feed up to 100 people. The week will wrap up with a Community Service Event at the Georgia Mountain Food Bank. All faculty, staff and students are encouraged to participate. Faculty and staff will receive 1 Wellness point for participating in the food bank service event, and hourly staff have been given permission to remain clocked in for the event. Sign up by Tuesday, Feb. 12, to participate in the Georgia Mountain Food Bank volunteer event on Friday, Feb. 15, using the following link. www.volgistics.com/ex/portal.dll/ap?ap=386706330. List “Brenau University” as the group name. The Staff Development Committee and Alpha Gama Delta thank you for your support of these important events during Hunger Awareness Week! As reported at the January faculty meeting, the IRB committee has implemented a few new changes, including revisions to the IRB protocol form and the review process for IRB submissions. You can find information about these new changes on the updated IRB intranet site and in Faculty Commons. For more information or if you have any questions, please contact Tamara Mills, IRB Chair at ude.uanerb@sllimt or Kelly Peters, IRB Administrator at ude.uanerb@bri. The Research Symposium Committee would like to announce that we are now accepting abstract submissions for the 2019 Research Symposium. This year’s Research Symposium will take place on Friday, April 5, in Brenau’s Downtown Center. Our theme this year is “Expand Your Horizons” and faculty members from the Trustee Library and each of the colleges will open the symposium with a round table discussion about their experiences with interdisciplinary research and teaching and how moving out of their comfort zone to collaborate with others outside of their field has influenced them. While we encourage submissions that touch on this year’s theme, it is not a requirement to be considered for inclusion. All students and faculty are encouraged to submit an abstract to be reviewed for this year’s research symposium. Students need to complete the abstract submission word document found on the Research Symposium Intranet web page and give it to their project advisor for review and final submission using the Formstack submission form by Friday, Feb. 15. If you have any questions regarding the Research Symposium please contact Kelly Peters at ude.uanerb@1sretepk. Please join us for the Spring Research Symposium from 12-5 p.m. Friday, April 6, at the Brenau Downtown Center. Come hear about some of the exciting research being done by our undergraduate and graduate students and faculty members as they present on a variety of topics ranging from bacteria to yoga. The schedule for the symposium is as follows, and a full copy of the Symposium Booklet, including a detailed schedule and abstracts for each presentation, can be found at intranet.brenau.edu/institutional-review-board/research-symposium. Thank You To Everyone Who Participated in Hunger Awareness Week! The Brenau Staff Development Committee would like to thank everyone who participated in Hunger Awareness Week, March 5-9. Together we collected 713 pounds of food for the Georgia Mountain Food Bank, painted 11 bowls for their annual Empty Bowl Lunch (which will help provide up to 1,650 meals), and broke down two pallets worth of food to be distributed in the community. We would also like to thank everyone who participated in our Food Drive Competition. The team from the library won the competition with the most points, 238, while the accounting office came in second, just edging the library out in volume with 134 items (equaling 189 points) to the library’s 128. Here are the final team totals as of the final count on Friday, March 9. Additional items not included were brought in over the weekend before the bins were collected and some items that were brought directly to the food bank. Thank you to everyone who helped to make this week possible and to bring a little more awareness to the Brenau community about the hunger many of our neighbors face every day. The Research Symposium Committee is still looking for faculty volunteers to help moderate sessions at this year’s Research Symposium. The 2018 Research Symposium will be held on Friday, April 6, from 12 to 5 p.m. in Brenau’s Downtown Center. Participants will give 53 presentations scheduled over 18 one-hour concurrent sessions. Please contact Kelly Peters at ude.uanerb@1sretepk by Friday, March 23, if you are interested in being a moderator for any of the sessions listed below.